Issam Aruri is the chair of the Palestinian Non-Governmental Organisations Network (PNGO), an umbrella of 134 civil society organisations in the West Bank and Gaza Strip that promote the rights and well-being of the Palestinian people. 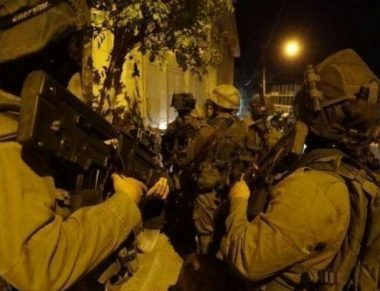 Israeli soldiers invaded, Tuesday, Palestinian agricultural lands in the al-Khader town, south o the West Bank city of Bethlehem, and posted orders for the illegal confiscation of 120 Dunams. Ahmad Salah, the coordinator of the Popular Committee against the Annexation Wall and Colonies in al-Khader, said the Palestinians found the military orders placed on their lands. Salah added that the orders also instructed the Palestinians that they have 45 days to file appeals against the military orders. The orders addressed each land owner by name, requiring them to evacuate from their lands, otherwise the military will take over by force. The Palestinian can also file appeals with the special court in Ofer military base, near Ramallah, in central West Bank. It is worth mentioning that such orders are rarely overturned by any Israeli court, and the lands are used by for the construction and expansion of illegal colonies in the occupied West Bank, and for military considerations, in direct violation of International Law, the Fourth Geneva Conventions and various international resolutions and treaties. Dr. Essam Yousef, head of the Popular International Committee to Support the Gaza Strip, has stated that the suffering of Gaza is “complex” and that the Israeli authorities are following a “lawless” policy in the Gaza Strip without being deterred by the international community which adopts laws and legislation that contradict the actions of the occupying state. “The occupation is acting as if it reigns in the Gaza Strip, doing whatever it likes with Gaza’s land and inhabitants, including [enforcing the] siege, starving, and killing [people]. The occupation is trying to impose the will of the most powerful who seeks to subjugate the weak and control his fate in a way very much similar to the law of the jungle,” said Youssef during a press release. “The siege imposed by the Israeli occupation on Gaza is immoral and inhuman and has been ongoing for more than 11 years. The innocent people living in the Gaza Strip are paying the cost without any real and active reaction on the part of the international community to stop it and put an end to this human tragedy, “said Youssef. He highlighted that data confirm banning the entry of hundreds of basic necessities into Gaza through the Kerem Shalom border crossing since its closure has been announced, thus resulting into a complete paralysis, and then a humanitarian disaster. “Isn’t the occupation satisfied with what happened to the residents of the Gaza Strip since the beginning of the siege, and until now? Aren’t the hundreds of patients who died because of the occupation’s decision to prevent them from getting treatment as a result of the siege enough? Aren’t the rates of unemployment among young people in Gaza which reached about 49 per cent, in addition to poverty rates among the population which amounted to 53 per cent enough?,” Youssef asked. “On top of all this, the occupation is waging repeated wars on the Gaza Strip, which took the lives of thousands of martyrs and wounded thousands of others, most of which were children, women and the elderly,” Youssef added. He stressed that the occupation does not recognise the Palestinians’ right to express their rejection of this huge amount of oppression and tyranny. Meanwhile, it is using its weapons and sophisticated missiles against the innocent residents of the Strip in case they resist injustice. He pointed out that all international laws and regulations, and our innate human nature, give the oppressed the right to resist injustice, defend itself, and fight for restoring its rights. The restoration of one’s rights can never be something granted by the occupation, which can give or take it whenever it wishes. During his speech, Youssef called for intensifying diplomatic and political action at all levels, Palestinian, regional and international, in order to put an end to the siege tragedy on Gaza and stop human suffering in the Strip. He stressed that security, stability, and peace can only be achieved through the recognition of the rights of the Palestinian people, foremost of which is the right to self-determination and the establishment of an independent state on its national soil with Jerusalem as its capital. The occupation has escalated its ongoing attack on the Gaza Strip, after months of tension and cautious calm, to the extent that observers expect that this escalation is the beginning of a fully-fledged war similar to the Israeli wars in 2008, 2012 and 2014. Is it really the beginning of a full-fledged war? What are the occupation’s objectives for its recent violence? The internal debates in the political and media arenas in Israel do not seem to indicate that there has been a decision to wage a war on Gaza. The government, especially Netanyahu and the Defence Minister Avigdor Lieberman, are leaning towards not carrying out such an attack for reasons related to the occupation’s inability to completely eliminate Hamas. Also because of the enormous media and political costs of the war, based on the experiences of the three previous wars. On the other hand, other parties in the government, such as Naftali Bennett, head of the far-right Jewish Home party, are pushing for war, perhaps to register political goals against the Likud. As for the military experts and research centres, they are divided over the appropriate options for dealing with Gaza, between the need to maintain the relative “calm” imposed by the recent war in 2014, and the launch of a full-on war to reimpose full calm in the so-called Gaza envelope settlements. Among the options are the Syrian and Lebanese fronts, as some government, military, and media voices are pushing for a focus on the security concerns and risks on these fronts, and refraining from waging a new war in Gaza. The Great March of Returns, kite, and incendiary balloons are a new major factor that could affect the Israeli decision-making process regarding the war on Gaza. The fires in the Gaza envelope settlements caused by the kites and incendiary balloons have put great pressure on the government. They have also acted as a tool for more radical ministers and military officials to score political points against Netanyahu, which has prompted the latter to carrying out more frequent air strikes under the pretext of targeting those issuing the orders to launch the kites. This is an effort on his part to ease the internal pressures and political bidding from more radical parties. Apart from the public pressures and demands, the real motivator for the recent Israeli escalation is the Israeli government’s desire to restore the deterrence equation produced by the 2014 attack, disrupted by the phenomenon of burning kites, because of the large fires caused by this phenomenon. In 2006, the occupation did not achieve a clear victory against Lebanon, but the brute force of the air force was able to deter Hezbollah from carrying out military operations that could lead to a full-on war with the occupation. Perhaps the most important statement made by Hezbollah leader Hassan Nasrallah in this context is that he would not have captured the two soldiers at that time if he knew it would lead to a war that would leave such destruction and victims in Lebanon. In 2008, the occupation also failed to achieve a clear victory against Hamas in the Gaza Strip, and was also unable to end its control of the Gaza Strip. It was not considering waging a full war due to the high political cost of reoccupying Gaza. On the other hand, the war produced a new deterrent formula, mainly that firing rockets from the Gaza Strip would mean a devastating war against it. This formula led to a state of calm, which of course ended in the 2012 and 2014 wars. The 2012 and 2014 attacks established almost the same deterrence equation between the occupation and Hamas in the Gaza Strip. Through its current escalation in the Gaza Strip, the occupation is actually seeking to re-establish the deterrence equation created by the past wars after the introduction of a new factor to this equation, i.e. the phenomenon of burning kites. The questions remaining are those regarding the position required by the Palestinians on the popular and resistance level. The Great Return March experience proved that peaceful popular Palestinian action is the most feasible in the current stage. On the one hand, it maintains the “clash” with the occupation, and on the other, it reverts the conflict back to its original state: a conflict between a brutal occupation force and an occupied people looking for freedom. It also imposes a higher political and media cost on the occupation at a lower cost to the Palestinian people than the war. Furthermore, it has the ability to get the issue of the unjust blockade on Gaza moving. The Palestinian resistance is the right of the people against the occupation, but the people and their leaders must calculate its results and make their decisions based on these calculations. Nothing at the current stage costs the occupation more and maintains more clashes and engagement with the occupation than peaceful resistance, and the Gaza Strip cannot continue to bear the high costs alone on behalf of the Palestinian national project. The United Nations (UN) is currently working “closely” with the Palestinian Authority (PA), Israel, Egypt and its regional and international partners “to prevent a conflict in the occupied Gaza Strip and improve the situation,” the agency’s Special Coordinator for the Middle East Peace Process, Nickolay Mladenov, said Monday. “The United Nations Development Program (UNDP)’s Programme of Assistance to the Palestinian People (PAPP) is currently implementing several job creation programmes to mitigate the impact of the harsh economic and social conditions in Gaza,” he told reporters. The programme, he explained, will initially create more than 2,500 short-term jobs within 12 months in the occupied enclave. “In the light of the serious escalation over the past few days in Gaza, the UNDP’s initiative is more urgent than ever,” the UN official pointed out. “I appeal to everybody to step back from the brink of a war,” he said. A senior Qatari official overseeing reconstruction efforts in the Gaza Strip has told Al Jazeerathat he believes the Trump administration has “nothing to offer” the West Bank, and is focusing its efforts on the blockaded enclave. Mohammed al-Emadi, director of a Gaza reconstruction committee set up by the Qatari government “to administer a $407m grant from Sheikh Hamad Bin Khalifa Al Thani to rebuild Gaza’s destroyed infrastructure in 2012”, addressed a number of issues in the interview published Tuesday. Asked about a recent visit to Doha by senior White House officials Jared Kushner and Jason Greenblatt, al-Emadi said the pair “proposed projects inside Gaza” such as “electricity projects, water projects, creating jobs, easy access, [and] 5G internet”. The Qataris, for their part, told the Americans that “for these projects to work, you need the Israelis to agree on them”, and “the problem here is that the Israelis are saying they will only deal with the PA [Palestinian Authority], not any other third party”. Pressed as to why the US was looking to help Gaza – and whether it was part of the so-called ‘deal of the century’ – al-Emadi replied: “As a personal opinion, I think Gaza has the power now. The Americans are thinking that they must solve the problems in Gaza first then go to the West Bank”. “As far as the West Bank, they have nothing to offer. They do not have anything to offer there in terms of development. Therefore, Gaza is very important. In addition, Gaza has military power and a deterrent doctrine. The number of rockets that Hamas has now is probably 50 times more than what they had in 2014”. According to al-Emadi, “the trust between Hamas and Egypt is lost”, whereas “Qatar is credible with both sides [Hamas and Israel] and is respected because of that”. However, he added, the Egyptians “have a strong position because they control the border with Gaza and without them, you cannot achieve anything”. Al-Emadi described the situation in the occupied Gaza Strip as “very bad”, noting that “the economy is going down because of the lack of cash and investments”. “Previously, things were a little better because the Palestinian Authority paid the salaries of its Gaza government employees and social services to the tune of over $100m – in addition to UNRWA that brought around $20m. The PA has cut its payout to Gaza employees and UNRWA has scaled back its funding and spending, which made the economic situation worse”. 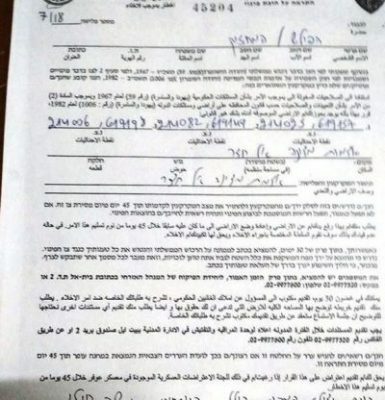 An Israeli activist was indicted yesterday for passing information to Palestinian Authority (PA) security forces regarding Palestinian land sales to Jews. Ezra Nawi, an Israeli activist working with left-wing organisation Ta’ayush, has been charged under section 7a (b) of the Implementation of the Oslo Interim Agreement on the West Bank and Gaza Strip. The Agreement prohibits Israeli citizens from joining or acting in the service of the PA’s intelligence and security forces. This is the first time that an Israeli citizen has been charged with this offence without actually joining the PA, Ynet reported. 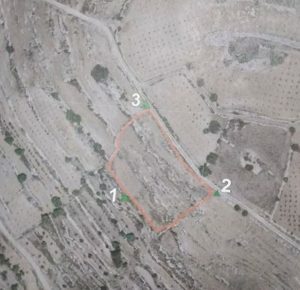 Nawi is accused of handing information to the PA regarding land sales made by Palestinian dealers to illegal Jewish settlers in the south Hebron hills, in the south of the occupied West Bank. The sale of land to Israelis is punishable by death under the Palestinian Liberation Organisation (PLO)’s 1979 Revolutionary Penal Code. More recently, land dealers have been handed sentences of lifelong hard labour if convicted of such a crime, according to the Times of Israel. Nawi’s alleged activities were exposed by right-wing organisation Ad Kan, a group composed of IDF veterans who deliberately infiltrate human rights organisations in order to report on their actions. Ad Kan objected to the indictment, demanding instead that Nawi be tried for “offenses of contact with a foreign agent and accessory to murder,” according to Arutz Sheva. Investigations into Nawi’s activities have been ongoing since 2016. According to +972 Magazine, Nawi was arrested at Israel’s Ben Gurion Airport while trying to leave the country and was subsequently denied access to a lawyer, placed under gag order and eventually released to house arrest. At that time, accusations against Nawi ranged from accessory to manslaughter, conspiracy to commit murder and making contact with a foreign agent. None of these charges have been included in the indictment issued on Sunday. +972 Magazine has interpreted Israel’s indictment of Nawi as a selective application of the Oslo agreement in a bid to target left-wing activists. In recent years, Israel has cracked down on organisations critical of the state’s human rights abuses and occupation of the Palestinian territories, including anyone affiliated with the Boycott, Divestment and Sanctions (BDS) movement. In January, Israel published a “blacklist” of 22 international NGOs “whose employees and/or members are banned from entering Israel due to their alleged support of the Boycott, Divestment and Sanctions (BDS) campaign.” In May 2017, Israel introduced a law forbidding entry visas or residency rights to foreign nationals who call for a boycott of Israel or illegal Israeli settlements. Patients in Gaza’s hospital’s organised a sit-in in central Gaza City to appeal to the international community, Quds Press reported, Tuesday. The sit-in included those wounded by Israel as well as rights groups. It took place in front of Erez Crossing where Gazans can pass through to receive treatment in Israel or Palestinian hospitals in West Bank. Speakers at the sit-in said that Gaza’s hospitals suffer from shortages in medicines, lab equipment and testing materials due to the Palestinian Authority (PA) sanctions and the Israel’s siege of the strip. The patients called for the international community to save their lives by lifting the siege and sanctions. Al-Qidra said that the Israel had killed 141 Palestinians and wounded 16,000 others during the protests of the Great March of Return. This put a heavy burden on the ministry of health and consumed most of the medical supplies. 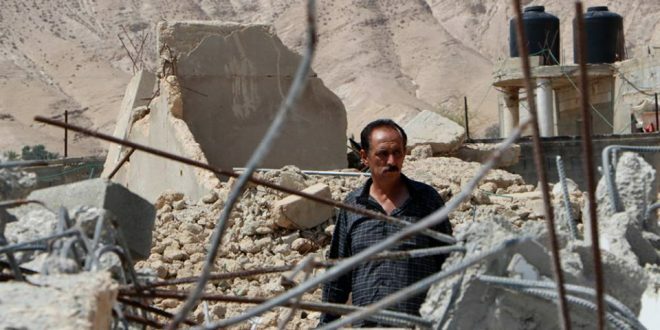 Israeli Occupation Forces (IOF) on Wednesday morning demolished two Palestinian owned homes in Jericho, northern West Bank, under the pretext of no building permit. At dawn on Wednesday, Israeli bulldozers broke into the area and demolished two homes in al-Duyuk al-Tahta area in Jericho. Local sources said that Israeli bulldozers demolished the homes under the pretext of unauthorized construction.